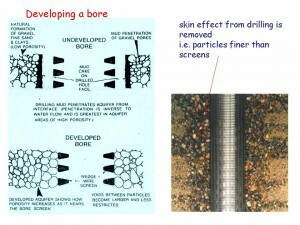 What happens when air developing a bore and why do we do it? Crystal clear bore water after air developing! Pictured here we see compressed air being pumped down a newly drilled bore hole. 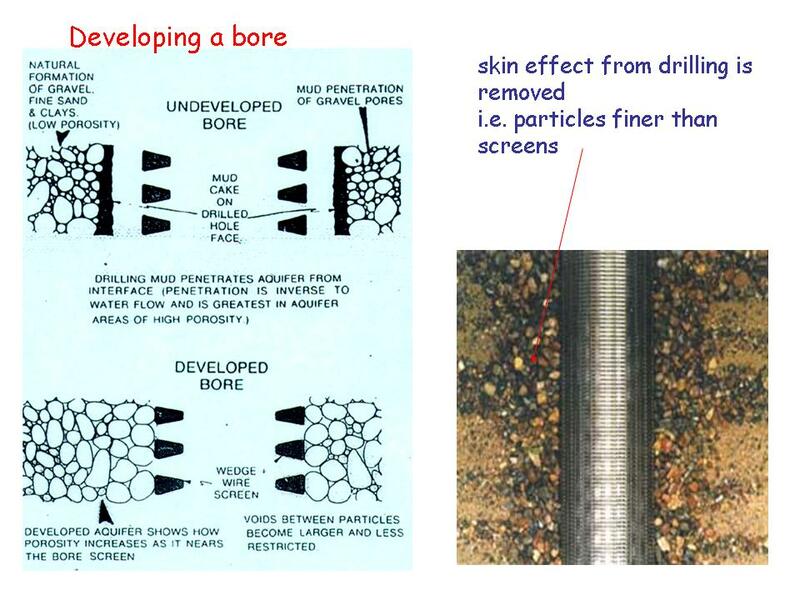 Initially all the drilling muds and drilling “fines” are flushed to the surface from down the bore hole. The force of the air also ensures the slotted casing at the bottom of the bore, which lets the water in, is thoroughly cleaned. The air also forces out into the aquifer and helps develop water flow. 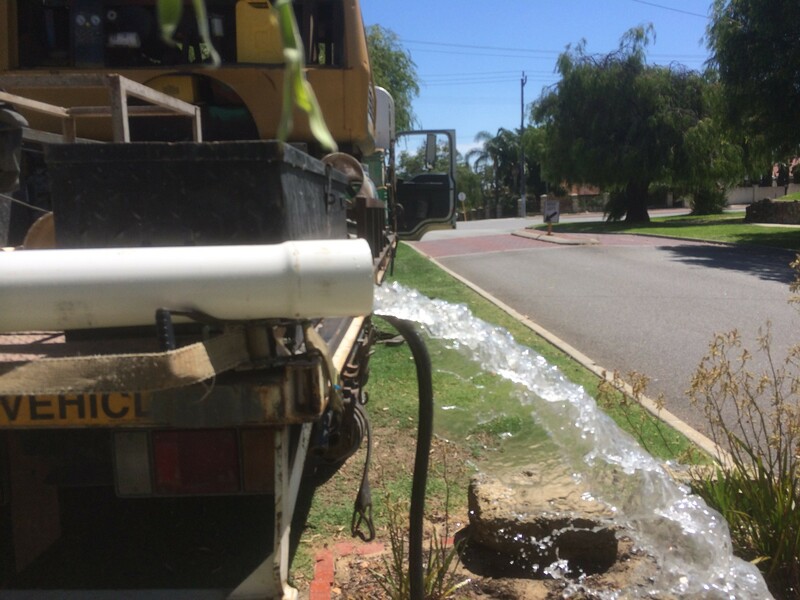 Seen here is groundwater being forced to the surface just by the power of the air being pumped down the hole. Once it’s all clean we will cut down the exposed bore casing to below lawn level ready to install a submersible pump. If you would like a well engineered bore with air development OR you have an older bore and the water flow has become sluggish call us anytime on 9246 0111 to discuss air developing a bore or other remedial action that may be appropriate. The adjacent diagram explains the process. The schematic shows a stainless steel screen but it equally applies to PVC slotted casing more commonly used in Perth bores. We will always make time to take your call and answer any of your questions. Check out the rest of the Virgin Bores site here, it has lots of information that can help with your bore and reticulation. 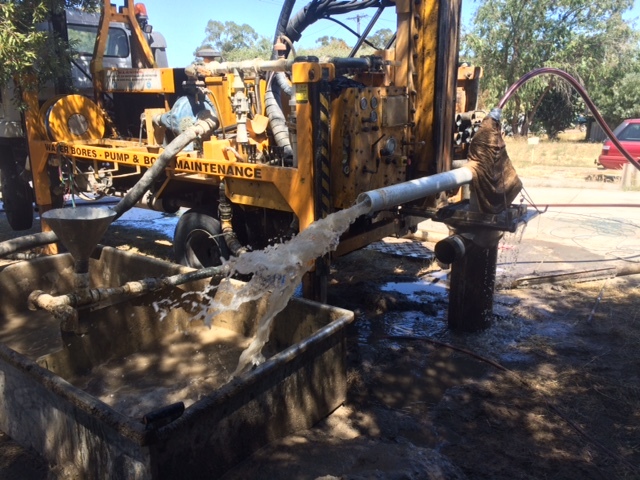 A newly drilled Perth submersible water bore being air-developed.